Color Guard: Blue Devils (18.7), July 28, Atlanta, GA Open Class: Brass: Oregon Crusaders (17.5), July 28, Paw Paw, MI Percussion: Oregon Crusaders (17.2), July 25, Edmond, OK Color Guard: Spartans (17.1), July 28, Paw Paw, MI View all scores and recaps. Storylines to watch • For the second week in a row, Carolina Crown tied itself for highest Brass score of the week. And just like last week, the corps posted the top score at the week's regional on Saturday, only to match its score at the next day's contest. • Blue Devils B (83.90) was dealt its first defeat of the 2012 season on Saturday, July 28 in Paw Paw, Mich. The corps placed third, behind Oregon Crusaders (1st, 87.15) and Vanguard Cadets (2nd, 85.05). Oregon Crusaders last beat Blue Devils B on Aug. 6, 2011 with a score of 92.35 to BDB's 91.65. Vanguard Cadets last finished ahead of their California rivals on July 17, 2010 with a score of 86.50 to 86.00. Both instances were the only Open Class defeats Blue Devils B faced in the respective seasons. 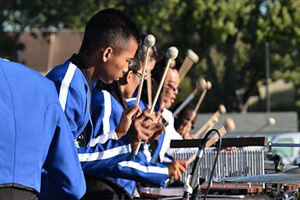 • Having earned three World Championship titles in the last three years, the last time Blue Devils B finished lower than second place in any Open Class competition was on Aug. 11, 2007 when the corps finished fourth at the Division II & III World Championship Finals in Pasadena, Calif. • Before the Open Class World Championship in Michigan City, Ind. gets underway Monday, Aug. 6, Blue Devils B will only see Oregon Crusaders and Vanguard Cadets one more time on Saturday, Aug. 4 in Niles, Mich. Oregon Crusaders and Vanguard Cadets will meet on Monday, July 30 in Lake Erie, Pa. and on Friday, Aug. 3 in Avon Lake, Ohio. 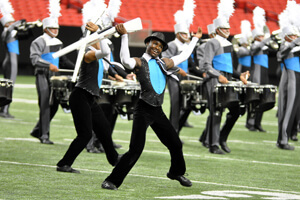 • The Cadets took the Percussion caption at the DCI Atlanta Southeastern Championship on July 28, placing three-tenths of a point ahead of Santa Clara Vanguard. Percussion proved to be a high point that night for The Cavaliers (7th overall, 5th in percussion) and a low point for Carolina Crown (2nd overall, 7th in percussion). The percussion caption continues to be anybody's for the taking. 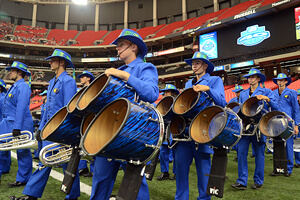 The following night on July 29 in Charlotte, N.C., SCV took top honors in percussion followed by the Bluecoats, Cadets, Blue Devils, Carolina Crown, Cavaliers, Phantom Regiment and Boston Crusaders. 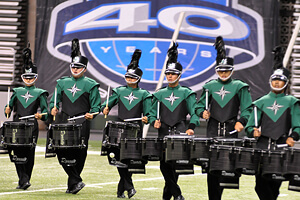 In percussion at the Charlotte event, less than a point separated first through fifth places. • The Cavaliers and Boston Crusaders continue to swap positions. 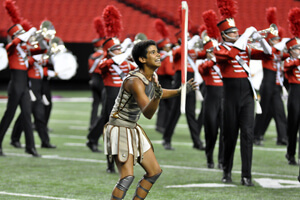 Following this season's trend, Boston Crusaders placed one spot ahead of The Cavaliers on Saturday in Atlanta, only to place 8th to the Cavaliers' 7th at a Tour of Champions series event the next day. • In Atlanta, The Cadets retook their spot ahead of Phantom Regiment, after trailing behind the Illinois-based corps since the DCI Houston event on Friday, July 20. The Cadets held onto their lead by a slim margin — five hundredths of a point — in Charlotte, N.C. on Sunday, July 29. • At this point in the season, Blue Devils, Carolina Crown, The Cadets and Phantom Regiment are the only corps to break the 90-point barrier. Santa Clara Vanguard and the Bluecoats are poised to join in their ranks, each less than two points away. At this time last year on the DCI Tour, five corps were past the 90 point mark (The Cavaliers missing out this year.) • Narrow margins were the theme in Charlotte, N.C. on Sunday, July 29. Two-tenths of a point separated Blue Devils and Carolina Crown, the smallest margin between the two corps all season. Bluecoats came within five hundredths of a point of Santa Clara Vanguard. All four corps won't meet again until the DCI Eastern Classic this weekend. Oskaloosa, IA Avon Lake, OH Allentown, PA Saturday, August 4 Allentown, PA Niles, MI Sunday, August 5 East Rutherford, NJ Pittsburgh, PA View the complete 2012 DCI Tour schedule. Photos by Chris Maher, CorpsReps.com, Jessica Skogh, Johnny Gilbert, Linda and Sid Unser.